Here are the three lucky winners (and their comments) for the latest giveaway! The designs all look fabulous! I especially love that strip skirt. Love your bag & pruses! & those skirts are just gorgeous! Keep them coming! Love the Stella pattern....want it, need it.....want to make it for my daughters. All of your patterns are wonderful..have ordered 3 of them so far and am making the Dharma Eco-Friendly bag for Christmas gifts. You are so talented and have wonderful designs. The winners were selected by random.org. Congratulations, gals! Please contact me here to leave your mailing information, so I can get those patterns out to you. I will be out of town for a few days, but will get your stuff out by the end of the week. Thanks to everyone for leaving comments. They were fun to read and I appreciate all of the kind words! Next up, the big STUDIO REVEAL.....stay tuned and as always, happy sewing! Things have FINALLY settled down from market now, so here is my post of the happenings. 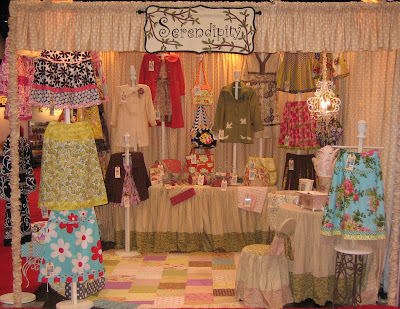 We had a great time, got to visit with friends we only see twice a year, and sold a lot of patterns. Below are a few shots of our booth at market. We tried different lighting this time. I bought some clamp lights from Home Depot and made little slipcovers for them so they wouldn't be hideous in the booth. They worked really well, so I am going to add a few more for Minneapolis in the spring. Of course, we had the new designs in the booth and everyone loved them! I wore a bit of something new every day to showcase the different new clothing designs. Stella was a BIG hit, especially when everyone found out she is made from Jelly Rolls! A lot of shops are excited about doing a class with the pattern, so I am excited that they liked the pattern so well. The mini-book, Little Luxuries, was well received. I think that the idea of pretty little organizers for traveling turned out to be a good idea. Torii and Emaline did very well also, with a lot of people excited about a more fitted design for a tunic. It looks like bag designs are still going strong, as Bijou and Abigail got a lot of attention too! Check out the photos of my outfits for each day to see how the new stuff "wears". Here is a good story involving Bijou. 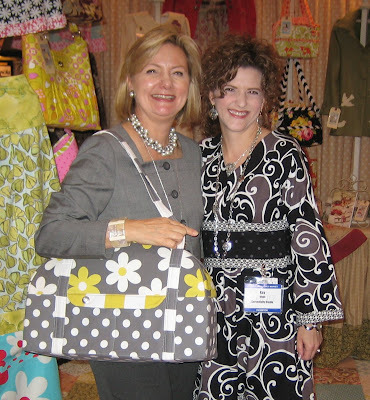 I have been very fortunate to get to know Kathy Miller of Michael Miller fabrics. She is such a wonderful person and so very generous. She has been so kind to promote my work along with her fabrics. If you haven't seen her blog posts at Making it Fun that I mentioned in a previous post...be sure to check it out (you'll have to scroll down a little bit). The photos are just fantastic. I have been lucky enough to work with their fabrics for most of the year now as they are coming out of production for my design work and it has been such a treat! As a big thank you, I decided to surprise Kathy with a bag of her own from one of her favorite new fabric lines, Plain Jane, in the citron/gray colorway. It couldn't have played out better....she snuck into my booth, saw the bag, swooped it up, and acted like she was going to run away with it! Imagine her surprise and delight when I told her it was hers anyway!! I couldn't have planned it any better....you gotta love it when that happens. Here is a picture of us with "the bag". If you are reading this, Kathy....thanks for everything! You are the best. That's about it for me with market. I did get to see some wonderful new fabrics that will be coming out soon...always an inspiration for new stuff, and a few other little delights that I found there as well that I hope will be influencing what I do for 2010. It will be an exciting year, I know already. I leave on Sunday for Cincinnati to do the technique photo shoot for the book. I am excited to see the process and so happy to be a part of it. I hope to take some behind the scenes shots of that to share with you when I return late next week. Remember that the book will be out the last part of June next year. I hope to share more as we get closer to that release. The book so far has been a good adventure. I have learned a lot and feel it has made me a better pattern writer. Now for the FUN PART.........it is Giveaway time!! I will choose at random 3 LUCKY WINNERS for a pack of one each of the new pattern designs....that is 6 patterns, folks! Just leave a comment about how you can't live without them or something to that effect and you are entered! This giveaway will run until noon CST on Saturday, October 24th, with the winners announced Saturday afternoon.